Wildwood marks the second MG I have ever read in years (those years being when I was a little kid reading these books exclusively). 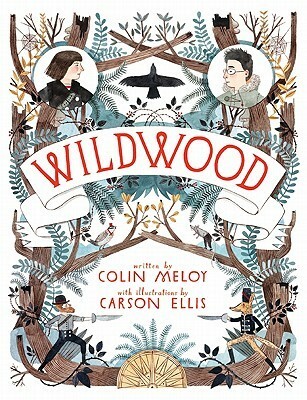 While I find that I'm not exactly comfortable with MG fiction, Wildwood was certainly a novel to get me acclimated to the genre. I find it hard to explain my thoughts of this novel, but I will try my best. Prue's baby brother, Mac, gets abducted by a murder of crows and Prue, realizing that she will not stand for this, blindly ventures into the IW, the Impassable Wilderness, to rescue him. However, she does not travel alone, and Curtis, a classmate of Prue's, joins in on the wild adventure. It's an epic tale full of adventure, action, and fascinating characters. I had to admire Prue's character for her persistence to save her brother and her bravery. The danger in this book was truly life-endangering and real, but Prue's love for her brother and her determination was much larger than any antagonistic force. Right from the beginning, I immediately liked her character. She was sassy and defiant, smart and courageous. She surprised me with her dimension and she shone throughout the entire book. And Curtis! He was also such a great character. His dorkiness made it hard for you to not love him and his overall character growth throughout the novel was amazing. There was this hero inside of him that was waiting for a chance to be loosed upon the world, and I'm sure that he surprised himself with his great amount of growth. And COLIN MELOY! You magnificent being! Your writing blew me away. I was drowning in the poetic beauty that was Colin Meloy's writing. The imagery was off-the-charts vivid. I was lost in the writing. I felt as if I was transported into the story itself, following Prue and Curtis on their adventures. The imagination and plotting that went into Wildwood is amazing. When I thought things couldn't get any worse, they did. Things would get real bad. This book meant business! While Wildwood is shelved in the MG genre, it is a bit on the lengthy side (but evenly paced), has advanced vocabulary, and has a lot of violence, so it might be a little too much for some kids. However, it was extremely enjoyable and I'm sold. It was beautifully written with characters just as dimensional as a cube. So many things went on and kept me highly entertained. Whether you're on the fence about MG, like me, or love it, I highly suggest reading this book. This sounds like a book I could buy my kids but yet enjoy myself if I chose to read it. Great review. I will definitely have to check this author out!